How to travel more. For less. That's always the question. Isn't it? 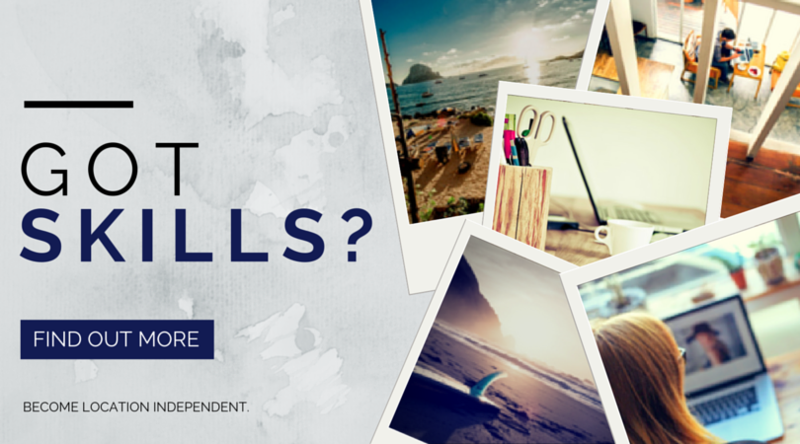 Whether your single, married, have kids... we all want to know, 'How can we/I travel more, and pay less to do it?" Our entire How to Fund Travel series is dedicated to interviewing real travelers to see how the pay for it. But there's another side to funding travel, that doesn't necessarily involve earning money, but instead saving (or NOT spending) money. It's something I've personally been delving into recently. When you're buying plane tickets for a large family, the costs can get exorbitant. What if there was a way to reduce them? But I specifically want to get into more travel hacking for flights. That's what allows people like Chris Guillebeau and Nomadic Matt to travel so much of the world, without being independently wealthy... they do it for free. This post will outline the basics of travel hacking, and share resources I've found for getting better at it. This can be done with a family, especially if your children are older. Nancy Vogel from FamilyonBikes.org is a prime example. 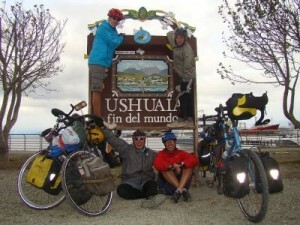 The road their bikes from Alaska to Argentina with their twin boys (age 10 when they began.) It took them three years to reach their goal. Jennifer Miller from EdventureProject.com also did a bike trip with their four children, who at the time ranged in ages from 8 to 14 at the time of their trip across Europe and Africa. It can be done with young kids too. Pedal Powered Family rode their bikes through North and Central America with their two kids, ages 3 and 16 months! Biking can be a great and unique way to experience culture and to mix with the local people on a more intimate basis. And it can reduce your transportation costs. We've flown to travel destinations before, but driving was our first travel experience (when we drove from the U.S. to Costa Rica). We realized that we really like it, and that it works well for a large family. It gives us more options for mobility and for getting around once we reach a destination. That's why were back at it again for Alaska to Argentina. Lots of family's have embraced this mode of transpo. It gives you freedom, choices, and significantly reduces initial costs. It helps you to get started sooner, and to keep moving when you have more funds. 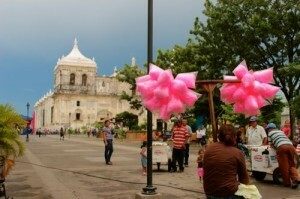 [/one_fourth] [three_fourth_last]Make sure to get my book on driving Mexico and Central America with your family. Everything you need to know about border crossings, safety, paperwork and much more! Something I would definitely like to do and learn more about. Can't share much info on 'hacking' it, but if you know about sailing, please share your experience in the comments below. That's why I've been researching frequent flyer programs and more. It is possible to earn free flights, and in a family of eight, every free flight is a big deal! Chris Guillebeau is definitely someone I look to as an expert on this. He's traveled to every country in the world, using primarily frequent flyer miles. He's created a program on becoming a frequent flyer master (20% off until this Friday). He also did a CreativeLive presentation on this topic, and has a Travel Hacking Cartel which shares regular tips and latest deals for earning miles. Of course, the basics of flight hacking begin with searching websites like Kayak and Google Flights, comparing (and being flexible) on dates and times, and searching flights on local airlines. Nomadic Matt goes into more detail on this on his travel hacking guide. Nomadic Matt's post also goes into more detail on hacking hotel costs, etc. I wanted to focus on other options for families. Couchsurfing is a website where you can connect with people who are willing to let you come stay at their place for free. This could be an option for families, especially if you only have a couple of children. We have stayed at many people's houses along our journey. In our case, they usually contacted us after finding our blog and invited us over, which means they already had an idea of what they were in for! We haven't actively pursued finding hosts on Couchsurfing because I always felt uncomfortable asking to come stay with my five kids 😉 But it is an option. GlobalFreeloaders and the HospitalityClub are supposed to be similar websites, but I haven't checked them out. Many housesitting opportunities include pet-sitting too, so just be aware of that. But if you want to stay for free in a (usually) nice house and get into the local neighborhoods/culture, this can be a great option. We have not taken any 'official' housesitting assignments... yet. The majority of them seem to be in Europe and Australia, although I have recently seen some in Mexico and Argentina, so I'm not giving up hope. 😉 But we have house-sat for friends and acquaintances in the States, Costa Rica, etc... so this IS an option! WWOOFING is where you agree to exchange work for food and accommodations on an 'organic farm'. (It stands for World Wide Opportunities on Organic Farms.) Again, might be an option for people with children. We haven't officially tried it, though we have had unofficial experiences with it. I'd love to hear from anyone who's done it with kids. This is something that we've done a lot of (we discuss it in this video we made about camping for free.) For us, we had a camper and a roof top tent (plus a ground tent.) We don't always stay at campgrounds, we'll often just pull over somewhere in a forest or field in the middle-of-nowhere-Mexico or El Salvador. I did find this website which looked interesting - Camp in my Garden. I quickly checked it out and saw they had places in León, Nicaragua (about 20 minutes from where we are now in Las Penitas), and in Costa Rica. We advocate slow travel with children, because it reduces some of the stress of constantly being on the go-go-go. It helps family's to stick to healthy routines, and allows for immersion in culture and language. Naturally, renting a house in the destinations you travel to is a great option to help your family do this, and is also a great way to reduce costs. Obviously, renting a house for a month (or more) is going to be a lot less inexpensive than paying for a hotel room (or two) every night. In many developing countries, decent housing can be found very inexpensively. In Guatemala, our rent was $230 a month, for a simple (but clean and neat) two-bedroom, furnished house with a nice fenced yard and a kiddie pool. Here in Nicaragua we renting a furnished house (that needed a little bit of work) right on the beach, for $350 a month. 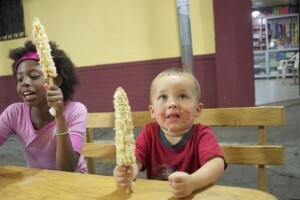 Eating street food is a great culture experience, and a great way to cut costs. Our family of seven can eat at the local market in Guatemala and spend $13. If we buy tacos at a taco stand, it can cost $10 for all of us to eat. Or we can go out to eat on Santander (the tourist street) in Panajachel and eat at a nice restaurant and spend a minimum of $26. That's nice to do sometimes, but not every time. Another reason why renting a place is nice, you can buy your own food and prepare home cooked meals. This is a really great way to save when feeding a family. Walmart owns stores all over the world (they are often called something different like Dispensa or Hypermas), but while they tout low prices, shopping at the local market you will get way better deals. Just yesterday, we went shopping at the grocery store in León, Nicaragua. They had a three pack of garlic for C50 (about US$2). Then we went to the market. A little pregnant lady walking around sold me a pack of eight garlic for C15 (US$0.60). Big difference! What 'hacks' have you done to help you reduce travel costs? I'd love to hear your ideas and experiences. We house- sat a friend’s place in Germany for a month (we’re from Victoria BC Canada)- they lent us their van (with car seats! ), bikes for us and the kids, bike trailer, scooters for the kids. It was a perfect set-up for our first “one month” adventure! We paid for flights (one free b/c of points) and food and entertainment while there! franzlisameier Sounds like some great ‘hacking’! Way to go.